Technically speaking, an executive desk is a workstation that’s six feet wide and three feet deep. Its construction often consists of commercial grade laminate or high-quality wood veneer, and it includes high-end details and features. It also comes with an upgraded hardware, glass storage doors, or bold color finishes. With executive desks, an office becomes a luxurious environment fit for working executives who constantly collaborate with team members and fellow department heads. One executive desk can already accommodate multiple people. If you’re looking for the highest quality and most functional workspace, you’ve definitely come to the right place. Below, you’ll find the best executive desks the market has to offer. We’ve also included a buying guide in this article to help you make a selection. The Cowdray Executive Desk is a traditional executive desk with 6 spacious storage drawers; two of which are lockable. It's one of the most affordable executive desks on our list, so it offers good value for your money, especially when you take into account the 10-year guarantee from the manufacturer. It has a size of 30.75'' H x 66.25'' W x 29.5'' D with a knee space of 26.02'', so it's a desk that gives its user lots of things to get excited for. Furthermore, it has a solid construction with a black desktop insert to complement the unit's Harvest Chery finish and pedestal legs. Apart from the six drawers, you also get a center pencil drawer that's perfect for stowing away pencils, memos, or even snacks! The second product on our list is a type of executive desk that offers a massive work surface, perfect for a multi-tasker. It comes with a keyboard tray or center drawer, several lockable box drawers, and a 1-year comprehensive warranty. Each drawer can be added with wood dividers to ensure your office files and paraphernalia are organized. This desk meets BIFMA or ANSI standards for safety. It also offers convenient accessibility holes for cables, which can be surprising as it has a classic/traditional style. As for its construction, it boasts of a combination of the best solid and manufactured wood topped with a handsome Cherry veneer. Measuring 30'' H x 72'' W x 27'' D, it's large, elegant, and stylish, making it one of the best executive desks around. The Hillsdale L-Shape Desk with Hutch provides the ultimate place to work. It even comes with ample storage. Its Heather Gray finish features metal accents in certain areas, adding character to a beautifully crafted piece. The main desk, which has a size of 30'' H x 59.45'' W x 59.45'' D, features a 4-port USB hub that lets you charge devices with ease, and open and closed storage compartments to hide letter-sized files and office supplies. The wire management system added on the desk's surface allows the cords from your office equipment to be hidden from plain sight. As for the hutch, it's big, measuring 36.3'' H x 59.45'' W x 11.37'' D. It has an enclosed storage cabinet with a stylish, fluted glass door. The Hillsdale Executive Desk’s hutch also comes with cubby shelves that make the best spot for displaying decorative items. It's certainly an executive desk that's made to impress. The Toledo L-Shaped Executive Desk with Hutch has the same exact features, size, and number of storage compartments as the Hillsdale L-Shape Desk with Hutch. What makes the Toledo L-Shaped Desk with Hutch a much more attractive option, however, is its charming Cherry finish. Just like the Hillsdale Executive Desk, it can accommodate your computer monitor, printer, laptop, and other crucial office supplies. The cubbies, shelving, and enclosed cabinets help organize and manage your office paraphernalia. What's really amazing about the manufacturer of Hillsdale and Toledo is the fact that they produce desks that aren't just fit for company executives but for gamers as well. Even the most robust gaming setup can be housed by this incredible piece of furniture. Not all people like extravagant desks, but everyone can make use of an extra work space! if you're on the search for a functional piece of furniture that has a clean, classic, and simple appearance, then your best option is the Series C L-Shape Executive Desk of Bush Business Furniture. It works incredibly well in any office setting from home offices to massive collaborative corporate environments. Its most notable feature is its construction which consists of thermally fused laminate, capable of delivering durability and strength to give you the most bang for your buck. Apart from the exceptional value you get to enjoy with this executive desk, it also comes with a wire management system to keep your desk clean and free of tangled cords. A clean workstation is a beautiful workstation, and if you possess a massive gear, you'll definitely need lots of extra storage drawers to keep your workspace tidy. With its massive size (30'' H x 72'' W x 84'' D), we know the Flannagan 72" L-Shape Executive Desk is a sure hit with you. It's a desk that is undoubtedly professional-looking with removable pencil trays, storage drawers that sit on black drawer glides, and felt-lined box drawers. It also has cable management grommets that keep things on your desk neat. That's not all this desk features as it's packed with lots of 'em! We're talking about the solid wood Maple construction with a chocolate patina finish. It even comes with a lifetime guarantee from the manufacturer covering the construction, workmanship, and parts of the desk. If you can make room for this desk in your office and you have a big budget to spend, we suggest you get this one. 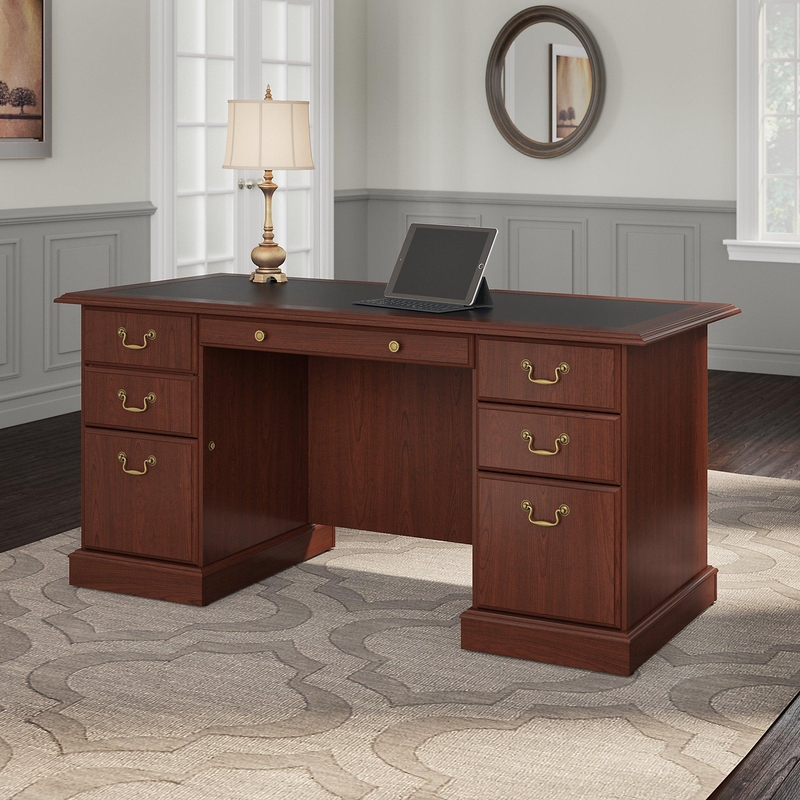 If you don't have the luxury of space, then opt for the Boonville Executive Desk instead. It allows you to update your workstation with elegance and charm without taking too much floor space. It's built to last and thoughtfully designed to offer you with storage amenities (lockable drawers, accessory drawers, and secretary pullouts) and the space that you need for work to stay comfortable and organized. Its rich Classic Cherry finish, decorative edge, and antiqued hardware give the desk a classic look that you will definitely love for years. With its durable, solid construction, you get generous work surface without breaking the bank. As the tabletop is made out of Cherry veneer, it's capable of resisting staining and scratches. The Ford Executive Desk in black oak finish is an incredible representation of what the manufacturer, Zuri Furniture, is capable of producing in terms of design. If your office has a contemporary or modern vibe or you're just on the lookout for a massive, exceptionally wide desk that is right for your office/suite, then consider this model. It's larger than your average executive desks and we love how it comes with a keyboard drawer as that means it's made to be functional and not just beautiful. Apart from having a work surface that doesn't look cluttered, you will also have a workstation that can accommodate several computer peripherals or multiple monitors. Weighing 264 lbs., this desk is definitely heavy. We are confident that you'll like this a lot as it has a cam lock system that allows you to assemble the unit quickly without using any specialized tools to complete the process. The Lachlan Arts and Crafts Executive Desk and Hutch is the last product on our list. It makes for the perfect statement piece for home offices that are traditionally styled. The old world, classic styling on this Cottage oak-finish traditional-style executive desk gives any space warmth and sophistication. If you want a desk that doesn't scream at you or your guests while providing just the right amount of space to mount your gear and store your office supplies, then the Lachlan Executive Desk might just be the piece that you're looking for! Now that you know what your best options are, narrow down your options further by making sure you consider the aspects listed below. Does your work require you to spend lots of time dealing with papers, books or files? If so, then an L-shape executive desk can satisfy your need for space. If you spend lots of time on your computer instead of actual papers, then the right executive desk for your case is one with a cable or wire management system that keeps cords out of your way. This useful system will also prevent accidents as you get up from your office chair. Regardless of what your work entails, the best executive desk is one that holds all the necessary equipment for work with ease and without any chance of caving in under immense pressure. If you make a selection from our list of the best executive desks available online, we guarantee you’ll have a sturdy, solid space to work on as we’ve tested them out ourselves. You already know executive desks are massive. But, they still vary in size with some larger than others. The larger an executive is, the more space you have for work. But, a bigger work surface is not necessarily good, especially if there’s space constraint. So, measure your space before you make a purchase. By taking heed of our advice, you’ll prevent yourself from experiencing the frustration and inconvenience of having to return a desk that won’t fit your office. Executive desks vary as to how they’re designed, which has an influence on how a unit can fit in a certain area. For l-shaped desks, they function best in corners of offices and they provide more than enough working surface. They also offer the greatest number of storage drawers and cabinets. The only problem with corner or l-shape desks is the user’s back will be facing a door when working. Rectangular executive desks, on the other hand, are your traditional desks. A unit can be placed at the center of a room or in the corner to save space. If you need to see who’s coming inside your office and you want an l-shape desk, make sure the unit you choose can fit inside your office even when it’s not placed against a wall. The suggested placement for your case is in the farthest area from your office door. To ensure an excellent traffic flow, make sure your executive desk is the perfect fit for the room in terms of size. Desks are constructed out of myriads of materials like composite wood, solid wood, metal, and laminate. The material used in a desk’s construction often dictates its cost. If you want an executive desk that’s made of solid wood, then you have to dig deeper into your pockets. If you want an option that’s gentler on the pockets, then get a desk made of composite wood, metal, or glass. Regardless of the material or desk you choose, make sure you get one that’s durable and easy to clean/maintain.